The highly talented team of our company presents Manual Cream Separator of fine quality. It is widely used for domestic purpose and also for small and large scale dairies to separate cream and milk reducing the fat content. Backed with a team of highly qualified professionals, we produce Manual Milk Cream Separator (HD - 11) 300 LPH of fine grade. This machine is running high in demand and is available at the best rates in the market. It is manually operated and is provided with a provision to operate electrically. 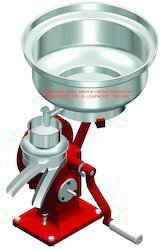 The capacity of the tank of this machine is 25 liters that is capable to separate 300 liter of cream and milk per hour. Additionally, it is being offered at the industry leading rates. 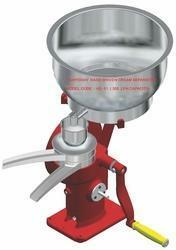 The highly talented team of our organization presents Manual Milk Cream Separator (HD - 9) 165 LPH. It is widely used in small and medium scale dairies and is highly appreciated for its durability, long service life and normal rates. This machine is manufactured using best grade raw material that is being sourced from known and trusted dealers. Additionally, it is presented with a 15 liter tank that produces 165 liter per hour of production. 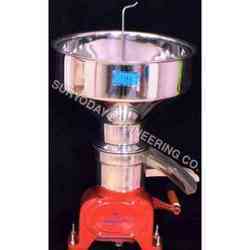 Looking for Manual Cream Separator ?